KHRG is a small organisation with a finite budget, but we are always looking to do more to support villagers' efforts to claim human rights for their families and communities. Donations from individuals or small groups are therefore always needed and warmly appreciated, regardless of size. US$15 buys a hammock with built-in mosquito net, backpack or cookset for one of our researchers: essential equipment for travelling in the jungle. US$30 buys a sealable, fully waterproof dry-bag that one of our researchers can use to protect notes, cameras, recording equipment, and important personal items during eastern Burma's long rainy season. US$70 covers all food costs for ten villagers to attend a three-day human rights workshop, where they discuss their human rights situation and ways that villagers can cooperate to avoid or reduce human rights abuse. US$135 buys a lightweight digital audio recording device our researchers can use to document over 500 hours of villagers' voices, the equivalent of between 300 and 500 cassette tapes. These testimonies inform KHRG's reports and our other main activities. US$285 pays for a two or three day workshop for 25 villagers, including all notebooks, supplies, and food. At these workshops held in the forest, people from several villages and forest hiding sites come together to discuss their human rights situation, plan ways to strengthen their ability to avoid abuses and claim their human rights, and cooperate to support each other. US$750 buys a computer for translating and transcribing villagers' testimonies, writing human rights reports and converting them to HTML to upload to KHRG's website. Whatever the level of your donation, KHRG will find a use for it. To make a donation of any size, please contact us using our contact page and we will provide further instructions. One hundred percent of the money we receive goes directly into our work. KHRG uses PayPal, a secure encrypted payment service which allows you to use your credit card to make a donation straight to our account. All transaction details are confidential and protected by encryption. As soon as your transaction is complete, KHRG will be able to access the funds. The PayPal service will keep 4% of the money you donate as a service charge. For donations of US$1 to US$300, this is significantly less than the service charge for an international bank transfer to us. If your donation is more than that you can still use the PayPal service, though an international bank transfer may cost less in transaction fees. Donations of any size are welcome. If you would like your donation to be tax-deductible, it may be possible to arrange this depending on your home country, provided the donation is sufficient to make the required bank transfers worthwhile. Please contact us using our contact page for further information. If you would like more information on exactly how your money would be or has been spent, you can contact us using our contact page. A simple and effective way to support our work is to buy a KHRG t-shirt. Wear this t-shirt and help villagers in Karen State to get their voices heard. 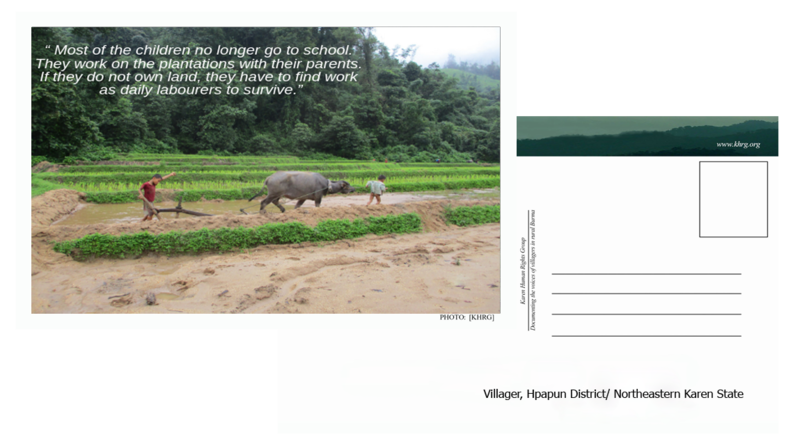 You'll find it is a great way to start a conversation with your friends or colleagues about the abuses Karen villagers face and thereby help to raise awareness of their situation. While at the same time, your purchase will contribute towards the continued work of KHRG. 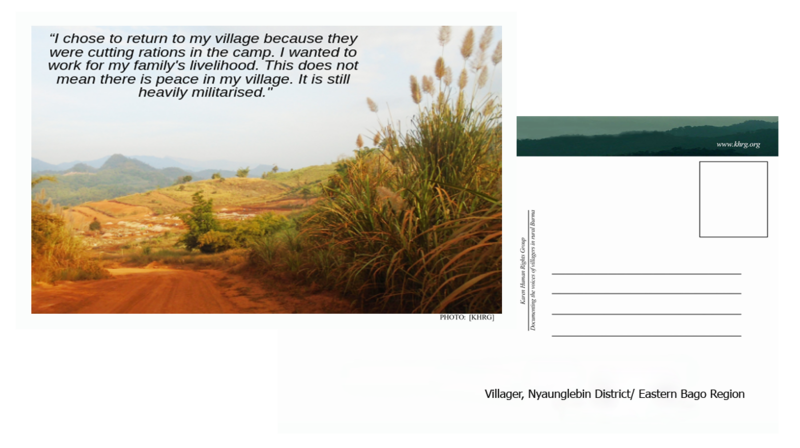 In January 2010, KHRG released Patterns of Abuse, a coffee table book containing more than 125 full colour pictures showing scenes of life in rural Karen State, from paddy cultivation to attacks on villages to flight as displaced people and refugees. Professionally printed on glossy paper and in a hard cover binding, this photo album will stimulate conversation, raise awareness and prompt reflection on more than 17 years of human rights research by KHRG. KHRG has few people and a small budget, so we seldom get the chance to conduct advocacy internationally. Wherever you live, you can help us - either by organising others to help support our work, or by using our materials and those of other groups (see the "Featured Links" section of our homepage) to increase attention on the situation of Burma's rural people among politicians, policy makers, media, students, and the general public. There may be local interest groups in the area where you live that you can collaborate with, or you may choose to work on your own or with colleagues or friends. If you need advice on specific things you could do or on what the policy priorities are in your home country or region, you are welcome to contact us using our contact page and we will see if we can help. For those interested in working directly with KHRG, we sometimes seek volunteers provided they can cover their own costs, are willing to stay a sufficient length of time and have skills we need - like expertise in web sites, advocacy or fundraising. We sometimes also have openings for longer-term full time paid staff. All of our field work is done by local people, so foreign volunteers can expect to work in our information processing and advocacy office. For more information, contact us to find out what skills we need right now. KHRG also welcomes submissions of Supplementary Research Papers by students or professionals interested in conducting desk research that supports our work. Prompts and explanations of the context that make them relevant to KHRG can be obtained by contacting us using our contact page. Topics generally include legal questions that relate to international human rights and humanitarian law, ethical questions that relate to field operations and theoretical questions that relate to how human rights organizations can position themselves in a highly politicized arena.